Today is Winter Solstice, which marks the beginning of Winter for those in the southern hemisphere. On this day the sun follows its lowest path in the sky, rising later and setting earlier than any other day of the year. Starting tomorrow the Sun will trace a higher and higher daily path until it reaches the Summer Solstice in December. Of course most people live in the northern hemisphere, and for them today marks the Summer Solstice. Contrary to popular belief, the seasons are not caused by our distance from the Sun. The Earth is actually closest to the Sun (at perihelion) on January 3, and farthest (at aphelion) on July 4. Although the changing distance from the Sun does have an effect on the Earth’s temperature, it is tiny when compared to the variation of the Sun’s path across the sky. It is our orientation relative to the sun, not our distance, which is the cause of our seasons. The axis of the Earth is tilted about 23 degrees relative to its orbital plane. 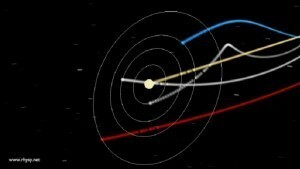 As the Earth orbits the Sun, its relative orientation changes (as seen in the figure above). At the Winter Solstice, the pole of your hemisphere is tilted slightly away from the Sun. As a result we receive less heat and light, which is why it is colder. As a result the seasons in the southern hemisphere are opposite to the seasons in the northern hemisphere, which is why Santa celebrates at the beach in Australia.